IDEAL FOR SECURING PLANTS. 100 x PLASTIC COATED PLANT RINGS. GENERAL PURPOSE FOR USE AROUND THE GARDEN. PRACTICAL DESIGN. Here you have 100 x Dark Green Cable ties, which are 100mm x 2.5mm, which are just the right size for holding plants,climbing plants, or just about anything in the garden that needs tying back so why not grab yourself a bargain. Secure plants, shoots, shrubs, flowers and bushes. Twist tie dispenser with cutter. Hang reels on small nail or hook to ensure easy access for use. Cut to length using built in blade. Raffia Tie Roll. Natural Raffia. Plant Support. Tea & Coffee. Pots & Planting. Use to tie plants. Strong and designed for outdoor use. 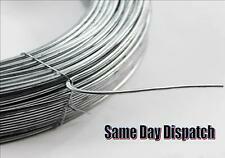 Curtain Wire. Aus Lauschaer Glas. NEU & unbenutzt. Verkaufen hier zum Einkaufspreis ! Vielen Dank für Ihr Interesse ! Strong, 350g natural jute Biodegradable, for tying most types of plant. . Gardening Ties. Scrape Ease Scraper from the 'Eggy' range by Joie. Flexible enough so you can use the way you want to. 3 Hook Hat and Coat Rack - Pine Finish. Do not send us back straight without confirmation. 2 Rolls 120m Nutscene Jute Twine Red & Green Heritage Spool 3-Ply Tangle Free. Gardman Plant Sticks 40cm 25 Pack From wild bird care, outdoor lighting and candles to pots, planters and hanging baskets, gardening footwear and gloves and even greenhouses, Gardman offer consumers a wide range of quality products for both home and garden. 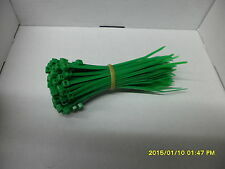 ---Green dyed flower/plant sticks ---For indoor and outdoor use in pots & containers. ---Can easily be cut to size. 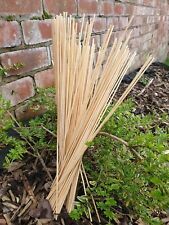 Please note we have 3 lengths available: 30cm x 50 sticks 40cm x 25 sticks 60cm x 25 sticks. Direct Fit. Strong, 350g natural jute. Biodegradable, for tying most types of plant. Lambda Sensors. Spark Plug Tools. Glow Plugs. Spark Plugs. DIY Car Service Parts. 2 Planting Seeding Guild Tools. 10 Strong Plastic Twist Lock Plant Support Ties. 20 Plastic Plant Support Ties. 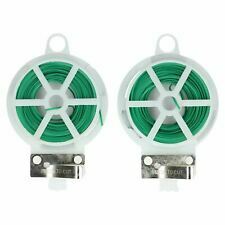 20M Green Twist Garden Wire On Wheel With Cutting Blade. Your Right to Cancel ?. Faulty products ?. MFG # 90594ACS. Easy to adjust and reposition as plants grow. Plant Ties. Cut to length needed. Great for trellises and hard to reach areas-no knots. Perfect for hydroponics and general gardening use. 20 x 4ft Bamboo Canes. Heavy duty, strong bamboo plant support canes. We will always help you to have a 100% positive happy buying experience. We will always go out of our way to source the product you are looking for. Perfect to use in the garden, greenhouse or indoor hydro grow room to help support or manipulate the plant to grow how you want. Maximum width of each plant ring: 3cm (can loop 2 together to get a further reach). Ideal for greenhouse and garden. Flexible enough so you can use the way you want to. Do not send us back straight without confirmation. 4pc Tweezer Set. For Electronic Repairs, Precision Assembly, Stamp Collection, H.
Gardman Plant Sticks 60cm 25 Pack •Green dyed flower/plant sticks •For indoor and outdoor use in pots & containers. •Can easily be cut to size. BAY HYDRO TEAM. This is VERY important you understand this. Bay Hydro LLC and the advertisers each reserve the right to limit the provision of their products or services to any person, geographic area, or jurisdiction they so desire and to limit the quantities of any products or services that they provide. FOR SUPPORTING GARDEN PLANTS. PICTURE OF ACTUAL ITEM. Flexible short and wide truss support for long and thick truss stems. Bamboo Plant Sticks. Gardening Sticks are ideal for supporting a variety of garden plants. Perfect for house, garden or greenhouse plants. 10 holes which allow multiple cane fixing. Fix this twine dispenser to the wall in the potting shed or green house and simply pull out the twine as you need it. Potting Shed Twine Dispenser. Twine can be replaced by unscrewing the end of the bar to release it from the dispenser. Maschengröße: 15 x 15cm. VDL Pflanzennetz 2 x 5m. Pflanzennetz zum Stützen der Pflanzen, um einen stressfreien Wuchs zu gewährleisten. Einfache Pflanzenführung durch Maschennetz. - sehr effiziente Hilfe zum Ausrichten der Pflanzen. 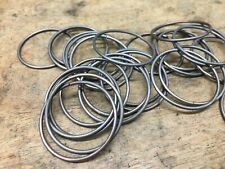 MIRACLE-GRO 10" STEEL PEONY RING 18" Legs PROTECTIVE COATING Rust Resistant NEW! MIRACLE-GRO 12pcs TOMATO TIES Breathable Material GARDENING Allows Growth NEW!